Ok, I was totally the weird geek kid during school. We moved so often when I was a child I was always the new kid no matter how long we stayed as we rarely stayed more than two years in any one place if not less. So I learned to rely more on my brains than my social standing in school and ended up hanging out with the geeky and "other" category. Not that I can complain it served me well after all I learned skills in high school that most other kids didn't and I learned enough about computers that my very first real job was as a computer tech even before I graduated high school. The only problem was you just never saw "geeks" on TV depicted in even a slightly good way. Urkle however changed all that with Family Matters. Urkle was still a geek and still was portrayed in a comedy.. but he was the first geek that was really proud to be a geek! I have to say I'm pretty proud as well. I watched Family Matters quite often during my high school years but after watching the full first season of Family Matters on dvd I have to say I'm surprised at how many episodes I had not seen yet and just seeing the episodes in order really gave me a whole new appreciation for the show itself. Steve Urkle is magical on the screen he's larger than life and so sure of himself no matter what people say or think. I wish I had half the courage that Urkle had!! With 22 episodes in the first season there is plenty of time to reminisce about the 90s and after watching a few episodes I realized the great.. and bad.. thing about sitcoms during this time is the story lines are really about nothing at all. I think that's really part of the appeal is its totally just a fun experience with no stress. My husband still watches Sienfield daily and he's seen every episode I can't even tell you how many times, when I asked him once why he still continues to run to his chair to watch every time it comes on he just said.. because it's no pressure! Family Matters has that sort of appeal, no pressure just laughs. You can pick up your own copy of Family Matters The Complete First Season on dvd right now and buy one on Amazon ! 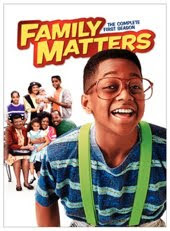 Disclosure: We were given a copy of Family Matters The Complete First Season free of charge, we were not compensated for this post in any other way. My opinions and comments on items we review are always my own and are never influenced by sponsors.